Dressing up little babies and toddlers is such a fun thing for mommies. Every mommie makes sure that her kids' clothes are as charming as their personality. And the fun doubles up when a li'l princess is at home. To me, it gives wings to my imagination while dressing up a baby girl and cutely accessorizing her. Which mommy doesn't want to let her little princess look the coolest in the bunch of friends in her smart dresses ;) With similar thought in my mind, to let my sweet niece flaunt all the jazz she has, I wanted a gorgeous dress and I unexpectedly stumbled across an unheard name Winakki. The name reverberate something special to my heart and I decided to get into the details of how & who nurtured this lovely brand. 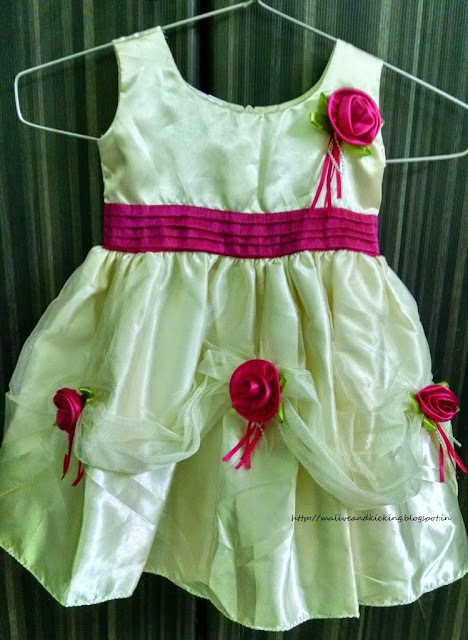 So I explored winakki.com and felt so good to know that its an entrepreneurial venture of Ms. Archana Kale, a mom to two toddlers Winnie and Akki who specializes in the creation of special dresses for toddlers and girls between the age group of 2- 8 years. 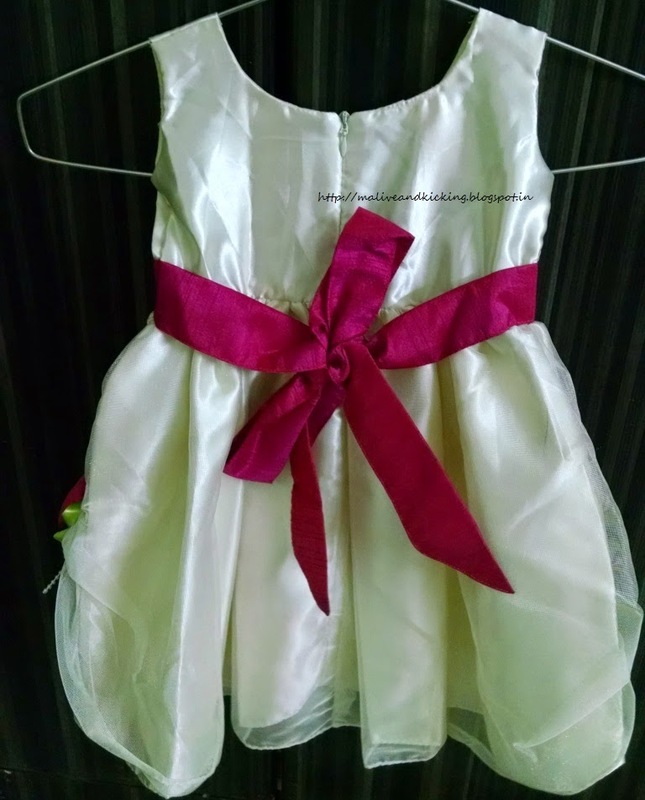 A cute sleeveless cream color dress with beautiful red flowers attracted me in the first glimpse and I ordered the dress in excitement and started waiting eagerly to receive it.. 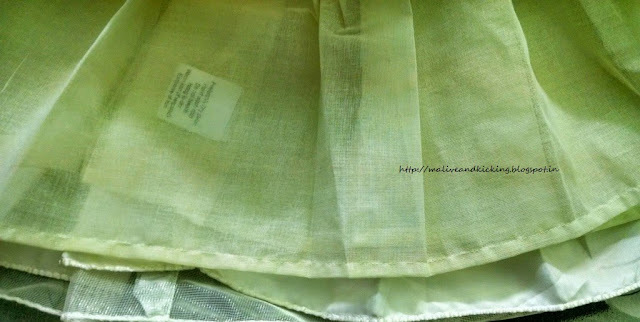 When I received the dress, I was just mesmerized ...see how beautiful it is !! 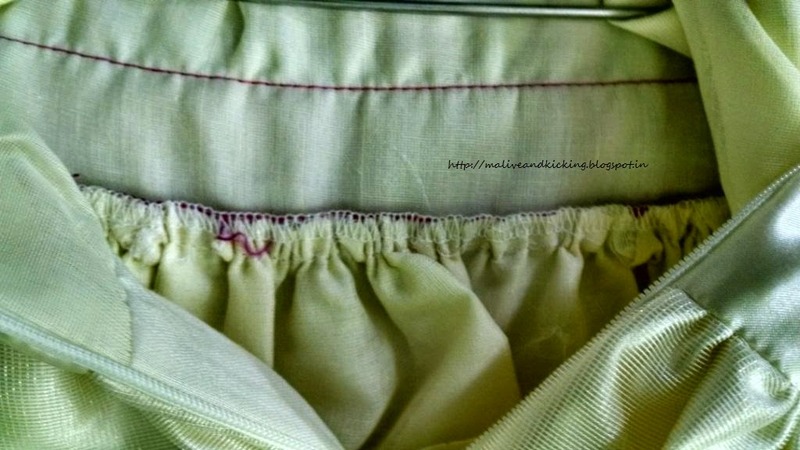 This Winakki Off-white girl's dress is woven fit and has neatly done gathering. The sleeveless flare dress with pinkish maroon accent and round neck makes the wearer feel like a princess in her own world. A rosette detail on the left shoulder is an adorable embellishment inspired from freshness of roses. A concealed zip closure with tie-ups on the back keeps the innerwear of the baby hidden and covered properly unlike the buttoned closure. So its a better design from this view point also. Those who are wondering how to make your delicate doll wear this satin dress in summer...worry not!! The dress has attached lining inside with fine interlocked stitch that will give a feather-like touch your gals's sensitive skin. The fabric used is child-friendly and the design has been kept fuss-free for not troubling the child. I would team this Winakki dress with a matching pair of ballerinas & a floral headband for a sweet and memorable look for my cutie's next special occasion. Ideal For: Party and Special Occasions. Available at: Winakki Kids, Flipkart, Myntra. 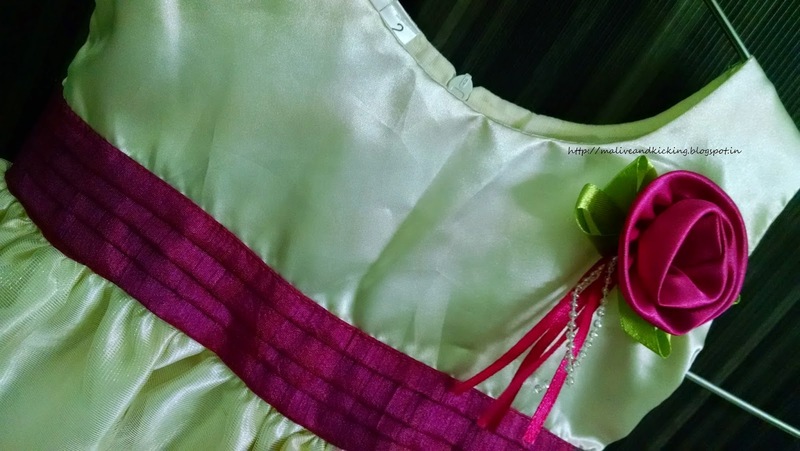 So you too can dress your little lady in the liveliest looks in this vibrant dress that she'll love to wear. Wow! I just love this dress. It's a perfect princess dress. I have always loved girls dresses more then boys as I always feel that boys dresses are boring with just t-shirt & jeans there's nothing more to explore but with girls dresses the options, choices are just endless. And maybe that is the reason why I had always dreamt of having a girl baby. But that never happen & I have a son now. Inspite of that when I go to a store I always find myself in the girls department. And this dress too grabbed my attention. I love all the detailing plus how comfy it looks & am sure would also feel the same way. It's a pretty dress which will look nice & make any girl happy & make her look like a dazzling princess in no time. Thanks for sharing this review.